go to town before noon. I was sewing all day. I finished my wrap in the forenoon and changed my silk skirt in the afternoon. I baked bread today. 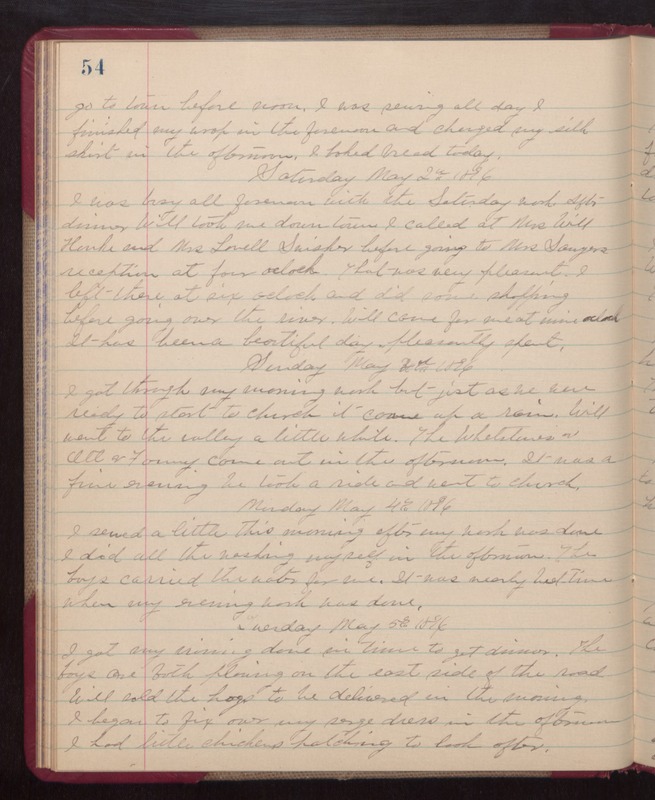 Saturday May 2nd 1896 I was busy all forenoon with the Saturday work. After dinner Will took me down town. I called at Mrs Will [Hunks?] and Mrs Lovell Swisher before going to Mrs Sawyers reception at four oclock. That was very pleasant. I left there at six oclock and did some shopping before going over the river. Will came for me at nine oclock. It has been a beautiful day pleasantly spent. Sunday May 3rd 1896 I got through my morning work but just as we were ready to start to church it some up a rain. Will went to the valley a little while. The Whetstones & Ott & Fanny came out in the afternoon. It was a fine evening. We took a ride and went to church. Monday May 4th 1896 I sewed a little this morning after my work was done. I did all the washing myself in the afternoon. The boys carried the water for me. It was nearly bed-time when my evening work was done. Tuesday May 5th 1896 I got my ironed done in time to get dinner. The boys are both plowing on the east side of the road. Will sold the hogs to be delivered in the morning. I began to fix over my serge dress in the afternoon. I had little chickens hatching to look after.